Fit-again Coloccini is finally back in contention for the trip to Tottenham tomorrow, but Pardew faces a tough call with Mapou Yanga-Mbiwa and Mike Williamson performing so admirably during the skipper’s absence. The pair were outstanding as they shut out Chelsea’s five-star forward line last weekend, a display that built on their resolute showing in the midweek defeat against Manchester City. Furthermore, Williamson has barely put a foot wrong since being returned to the starting XI at Cardiff. Pardew was giving away absolutely nothing yesterday morning apart from confirmation that Coloccini has trained and will be available if he calls on him. He lavished praise on the rapidly improving Yanga-Mbiwa, however, along with Williamson – who he thinks is getting better with age. For Pardew, the way the team have responded to the loss of their skipper proves that the group is maturing and developing. “This is the first time we have lost Colo and looked comfortable,” the United boss said. “Certainly more comfortable than when he has been out in the past. That is been a big boost for us as a group because when you lose a player and think you can’t cope, then it affects everyone else. The biggest bonus for Pardew has been the development of Yanga-Mbiwa, who Newcastle have invested time, finance and patience in. Although there was talk from Montpellier that he would be welcomed back there, United never had any intention of giving up on him. Pardew has been full of admiration for his work ethic and professionalism, especially after being dropped post-Everton. “Mapou (Yanga-Mbiwa) is an interesting player because a young centre-half, captain of his former club in France, comes into the Premier League. 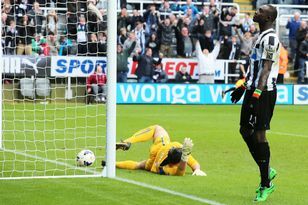 It is obvious he is going to have some games that don’t go well for him,” added Pardew. “He’s so young as a centre-half in this league but I have really admired his work ethic and the fact he has come back in after being left out and put in the performances he has. I thought he was terrific against Man City. So that has been a big bonus. “Williamson has got better because I genuinely think centre-halves do get better as they age. “They get more experience, more understanding and more knowledge of the top players. Pardew is brimming with confidence after seeing his team play with so much assurance against Chelsea – a trend that has followed on, he believes, from the second half against Everton. The one glaring exception is the first half against Sunderland but the Newcastle boss has a valid point when he suggests that the Magpies have a platform to build on. Get something at Spurs – which they can do – and they are suddenly faced with a run of games that gives them something to build on. “I think we have been very solid since the first half at Everton and the points total we’ve got (since then) reflects that,” Pardew said. “But then a game comes around like this one, when you can push yourself up a notch. “I am not going to hide from the fact that the next period of games after Spurs, looks better for us.